@OccupyChicago spend their sixth day protesting corporate abuse around the world. I'll tell you the truth: I've been confused about what, exactly, the protestors of Occupy Chicago wanted. My basic understanding has been that they're mad as hell about economic inequality and corporations. But what specific things they wanted changed about how business is done has been foggy at best. These photos from the protest, which is now in its eighth day of 'round-the-clock residency on the sidewalk in front of the Federal Reserve Bank of Chicago at Jackson and LaSalle Streets, help clarify things somewhat. One of the protest signs says "We are demanding accountability for corporate greed and corruption, reforming campaign finance laws, closing tax loopholes & ending corporate personhood." Those are some more-concrete goals I can understand. Reading the group's website, I now see that the very real increase in the wealth gap between the richest and the rest of us in the United States is a major source of the anger on display downtown. Lupe Fiasco, who is outspoken in his music about poverty and inequality, is a big supporter. 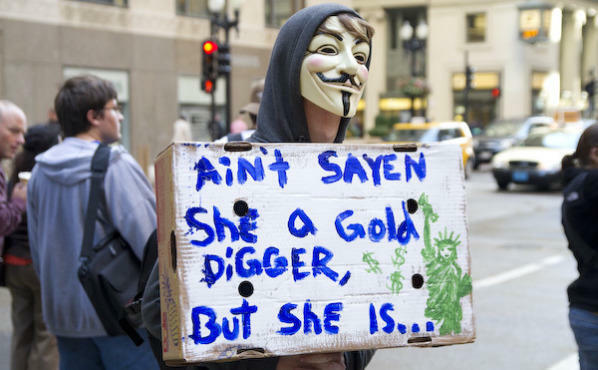 The Chicago protest is a close relative of Occupy Wall Street, which began occupation on Sep 17th in New York City, and despite some run-ins with the NYPD, is ongoing. Can Occupy Chicago survive the winter?